License(s): Public domain in the USA. eBook HTML, ePub, and Mobi (Kindle), etc. This book is a classic psychology essay that explains why a successful business man in his eighties still wakes up early and reads the papers. It is a matter of developing good habits that makes people successful. This book will teach you how to develop the habits that lead to success. First published in 1914, this early self-help book is part of a series of inspirational works designed to boost personal and professional effectiveness through the use of the then-new discipline of psychology. Career advisor Warren Hilton offers advice on how to employ the science of mind power to develop ideas for business, harness the creative power of thought, use psychology to select employees, and more. 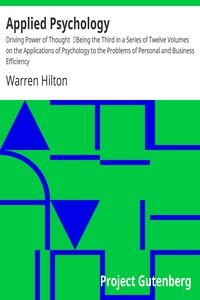 Within the pages of Applied Psychology: On The Driving Power Of Thought And The Habits You Must Attain for Unbounded Personal and Business Success, Hilton addresses the factors in achieving success by utilizing the powers each of us has within us. Subjects addressed include Attainment of Mind Control in which he guides the reader through methods to better utilize his own thoughts, Relationship of Mind Activity to Body activity where he shows how our physical body follows where the mind leads, The Supremacy of Consciousness you latent powers and purpose are exposed. Warren Hilton is an american lawyer and writer. Warren Hilton founded the Society of Applied Psychology in 1914. The Mirror Site (1) - Multiple Formats: PDF, ePub, Mobi (Kindle), etc.